With 10 years of experience building enterprise applications, we are the blockchain development company with a deep understanding of AI, IoT and cloud services. 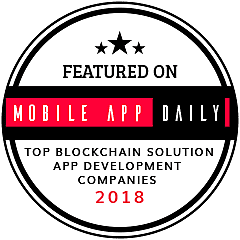 Our blockchain development team involves IBM Development partners and Hedera Hashgraph Ambassadors. We have a qualified team of blockchain developers and experts ready to implement your custom solutions. 15+ Blockchain platform and 80+ Smart contracts deployed. LeewayHertz is an experienced technology company with an award-winning portfolio. Our blockchain development team involves IBM Development partners and Hedera Hashgraph Ambassadors. TraceRx is a Distributed Ledger Platform for Tracing Shipment of Drugs. It allows the UNO to trace the distribution of free drugs and identify inefficiency and losses. "I came to LeewayHertz because of their reputation in the software development space. When we expanded the project to incorporate blockchain not only did they not flinch, they got more enthused. They have been stellar at every step of the way working towards solutions that worked straight to the heart of the idea on a micro and macro sense." "Well, working with LeewayHertz on our iCruise app was delightful. From the first meeting to the launch of the app, the development team was very forthcoming and active. They laid in front of us a very clear and realistic roadmap to ensure that everyone was on the same page."